The title role in Paganini was the first that Lehár wrote expressly for Richard Tauber, although he had already sung in Zigeunerliebe and Frasquita some years earlier. In fact Tauber didn’t sing the role at the world premiere in Vienna on 25 October 1925, where Carl Clewing replaced him. Tauber had a contract with the Berlin State Opera, which required him to be in Stockholm at the time of the Vienna premiere. It was not until January 1926 that he sang the role for the first time in Berlin. However the Berlin impresario was at first reluctant to mount Paganini at all since it received such a cool reception in Vienna. In the event it turned out that the Berlin production was a great success and ran for three months. The female lead in Berlin, Princess Maria Anna Elisa, Napoleon’s sister, was sung by Vera Schwarz, a leading Austrian soprano who sang at the Staatsoper unter den Linden in Berlin and for several years at the Vienna State Opera. She is probably best remembered for her collaboration with Tauber. This was not only in Paganini but more famously at the premiere of Das Land des Lächelns in Berlin 1929, under the composer, when they also recorded some excerpts from the operetta. Whether the plot of Paganini, a supposed love affair between Napoleon’s younger sister and the violin virtuoso, is historically correct is moot. At all events Lehár wrote some truly memorable songs for the main characters and the concert master has some flashy violin solos to execute. The play opens with a group of villagers standing in front of the tavern listening to Paganini playing inside. Henry Raudales plays exquisitely with pinpoint double-stops. Then the story begins to unfold. Anna Elisa has her entrance song, backed up by the chorus of villagers and then hears the violin playing and wonders who it is. Paganini appears and sings a song in praise of his native land, Bella Italia. In a duet Paganini tells the princess about his love of his instrument. In her next song Anna Elisa admits that, in spite of already being married, she has fallen in love with the violinist: So ein Mann ist eine Sünde wert (A man like him is worth a sin). Another love story sails up. The Prince, Anna Elisa’s husband, has a mistress, Bella, who now appears and Pimpinelli, the Prince’s chamberlain, at once woos her. Now we are beginning to see a true operetta story. This second couple also sings a duet, a charming waltz, and then we reach the first act finale, almost a quarter-of-an-hour long. Here Paganini learns who the charming lady is and he falls in love with her, as she had already done with him. When the second act begins six months have passed and Paganini has been appointed maestro di capella of the court in Lucca, where the Prince and Princess reign – and Bella is the prima donna. He is sad because he has lost everything he owns to Pimpinelli in a game of cards, yes, everything; worst of all: even his violin. 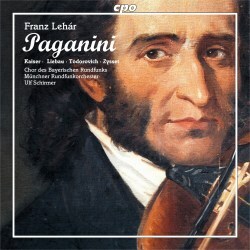 Pimpinelli promises to give it back if Paganini tells him how he charms the women. Then follows the most famous song in the operetta and one of the most famous in any operetta: Gern hab’ ich die Frau’n geküsst, somewhat unidiomatically translated (Girls were made to love and kiss). Now you are really interested to know what happens next, aren’t you? I won’t tell you! I have a better suggestion: get the recording and find out yourself. It’s a charming operetta, full of lovely melodies and as usual it basks in Lehár's masterly orchestration. It is also very well sung. Kristiane Kaiser, after a good but slightly hesitant start, only gets better and better. Just listen to the waltz-song Liebe, du Himmel auf Erden (CD 2 tr. 2) – one of the gems here and so beautifully sung. She is in the Anneliese Rothenberger class, which is praise indeed. Zoran Todorovich, who has taken part in several earlier operetta recordings for CPO, is here at his most charming and brilliant. He has gradually taken on more dramatic roles over the last few years – singing Lohengrin and Otello among other things. His voice has darkened but he has retained the schmaltz in the tone. He sings some truly wonderful pianissimo phrases, worthy of a Nicolai Gedda. Eva Liebau’s Bella is charming and Martin Zysset’s Pimpinelli doesn’t let the side down. Ulf Schirmer is a masterly operetta conductor and his choral and orchestral forces are also well versed in the idiom. The operetta was recorded live at a concert and there is some applause. Otherwise there is little that reveals there is an audience present. A couple of hang-ups though: there is no libretto enclosed, only a summary synopsis. The spoken dialogue is very clearly recorded but for those with no German or who are less than fluent a libretto with translations would have been welcome. Then, less seriously perhaps, several timings have been mixed up in the track-list. If you can stomach such shortcomings you have here a splendid recording of one of Lehár’s better operettas. The old Electrola recording (1977) with Nicolai Gedda and Anneliese Rothenberger has recently been reissued for the umpteenth time and it will probably never be completely surpassed, but a cast of Kristiane Kaiser, Zoran Todorovich and the rest is a serious challenger. It should be considered by all operetta enthusiasts.